Before the Mad Way South crew, no one had attempted to cross the Sahara desert by wind power alone. Few would be crazy enough to believe that it could even be achieved. Mad Way South follows four adventure junkies as they race their Kite Buggies across 2200 kilometres of the Sahara desert. Initially they expected to encounter an endless sea of flowing sand dunes. 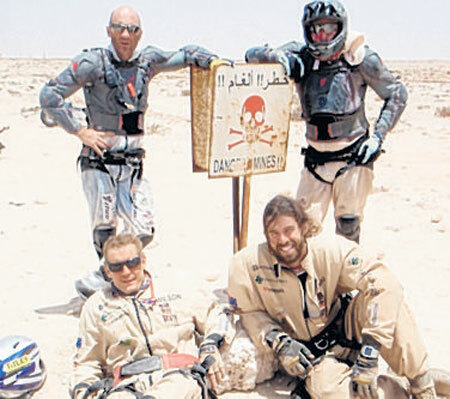 They instead found a brutal desert landscape with intense daytime heat and harsh night time cold temperatures that pushed the competitors beyond exhaustion. Add to this many surprising challenges, one of which very nearly put Gurney in an early grave..(..again!). The Mad Way South adventure was initiated by Geoff Wilson, a Veterinary Surgeon and adventure junkie from the Gold Coast Australia. With the help of New Zealand kite manufacturer Craig Hansen, they formed a team of Adventurers and support crew that could ultimately make this “thought in the night” become a reality. In the process they would be attempting three world records, including the main goal of crossing the Sahara Dessert by Wind Power. "Listen Geoff. It can't be done"
Telling Geoff Wilson that something can’t be done will only mean that he will immediately try to prove you wrong. 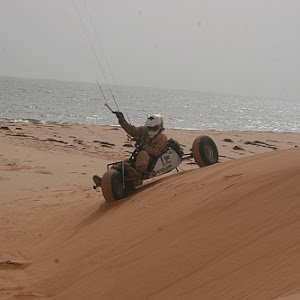 After learning that the existing world record for distance covered by Kite Buggy stood at 1000 kilometres (620 miles), Geoff hatched the plan to tackle the Sahara Desert from North to South, a record breaking distance of 2100 kilometres (1,300 miles). While Geoff was a complete novice at the sport – a minor detail as far as he was concerned – he would be joined by fellow Australian Garth Freeman, a kite flying expert. A challenge was thrown out and two New Zealanders responded to the call. Craig Hansen, an accomplished Kite Buggy designer was first onboard followed by Steve Gurney a highly successful adventure athlete who had taken out the prestigious New Zealand Coast to Coast race a staggering nine times. Like Geoff, Steve had no previous experience driving a kite buggy, in fact he’d never even seen one. This alone made the challenge even more appealing for Craig. With two teams established, the world’s most difficult Kite Buggy race was ready to roll. 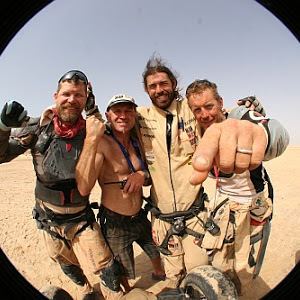 The Sahara Challenge is a one hour documentary that follows this crazy bunch of adventure junkies as they do battle with each other and the extreme and unpredictable Sahara environment. Up for grabs are the bragging rights and prestige that come with establishing a new world record. But first, the competitors have to survive the most difficult challenges imaginable. What is a Kite Buggy? A Kite Buggy is a light, purpose-built vehicle powered by a large kite. It is single seated and has one steer-able front wheel and two fixed rear wheels. The driver sits in the seat located in the middle of the vehicle and accelerates and slows down by applying steering manoeuvres in coordination with the wind as it carries the kite. Kite Buggies are popular throughout the world and are recognised as an extreme sport. With wind being the only power source, riding these vehicles can be highly unpredictable and at times extremely dangerous. It’s not unusual for the buggies to exceed 120 kilometres per hour. Starting in Southern Morocco the teams set out to race through Western Sahara, Mauritania and into Senegal. They couldn’t have chosen a more difficult or dangerous route. Initially they expected to encounter an endless sea of flowing sand dunes, the kind of terrain that the buggies would almost glide across, but instead they’ve come face to face with a far brutal landscape. The buggies begin to disintegrate under the constant stress. Tempers flare and relationships break down. As fatigue grows, mistakes are becoming more common. The competitors are constantly getting lost and straying into military patrolled no- go zones that contain live mine fields. 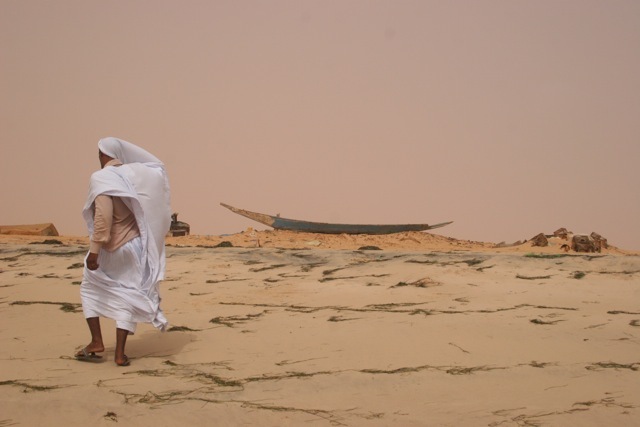 Fears rise as they pass through desert stretches notorious for pirate attacks. Then tragedy strikes, Steve Gurney is thrown out of his buggy and hospitalised in a critical condition. They push on without him, but after several weeks of intense racing the competitors ran out of spare buggy parts and kites. The hard working support crews had had enough and wanted to abandon the expedition. It’s this crisis that leads them to the realisation that that they must now work together if they have any chance of completing the challenge. It’s no longer a race, now it’s about survival and persistence. 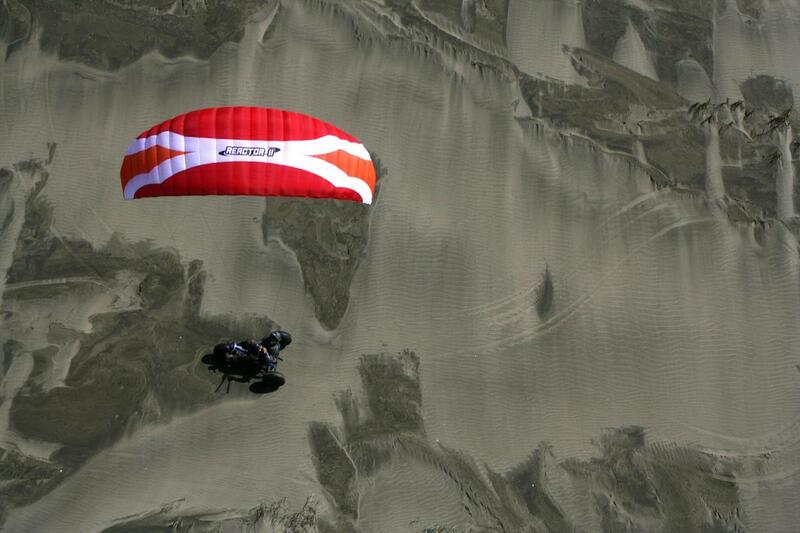 Incredibly Steve Gurney is able to rejoin them just as they cross into Dakhla to equal the existing Kite Buggy distance record of 1000 kilometres. They push on relentlessly and next 1160 kilometres are ferocious. The day time temperature consistently rises to 50C. Water supplies begin to run low and the teams are forced to travel at night to take advantage of the northerly winds. In a welcome change of scenery, the buggies power down the spectacular coastal strip of Mauritania before crossing heavily guarded checkpoints at Nouakchott. 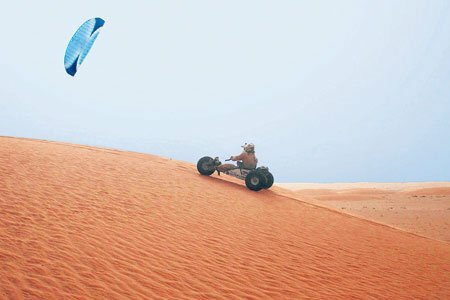 The sight of Kite Buggies navigating the terrain attracts constant attention from locals. For the team, this provides wonderful opportunities to embrace new cultures and customs. After 26 days, the buggies and the entire team literally crawl into Senegal. A total of 2,160 kilometres have been covered. Together they’ve established two new records - the first individuals to cross the Sahara by wind power and the longest distance covered by Kite Buggy. The Sahara Challenge is a fast-moving documentary – pure adventure television with great characters, extreme sand-jumping Kite Buggies, spectacular locations, desert dramas, and a triumph of the human spirit. Want more? Here's a link to Steve Gurney's Journal entry on the trip, along with some video clips.